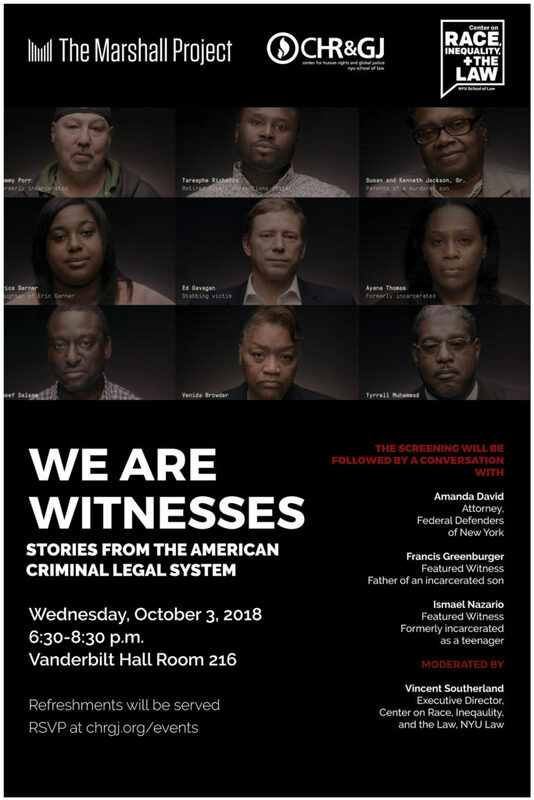 Please join us for a conversation centering the experiences of people intimately familiar with the United States criminal legal system. Taking a human rights-based approach, this event rests on the premise that bearing witness to the harms caused by the racism, inequality, and unfairness of this system is a necessary prerequisite to addressing them. The event will feature a series of short film interviews with people directly touched by the system; a moderated conversation with some of the film’s interviewees; and an audience Q & A. This event is organized in collaboration with the Marshall Project and NYU School of Law’s Center on Race, Inequality, and the Law. UPDATE: Judge Eduardo Padró will replace Ismael Nazario on the panel and Neil Barsky, Founder and Chairman of the Marshall Project will introduce the event.